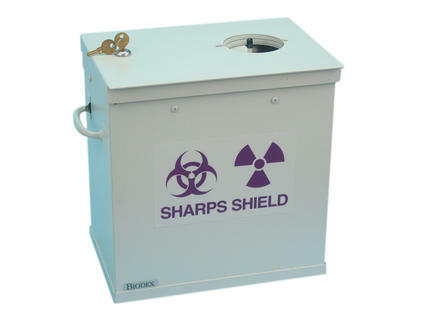 This Sharps Container Shield is a simple, safe and convenient solution for disposal of used syringes that may be contaminated with high-energy isotopes such as I-131. The shield is constructed of steel lined with .5" of lead (1.3 cm). The shield features a hinged top with a sliding port and side handles which allow for easy transport. It will accommodate both small and medium Monoject Sharps containers.